The last 12 months have been somewhat of a roller-coaster ride for Jamie Dimon and JPMorgan Chase . Yesterday, the Federal Reserve released the results of the annual Dodd-Frank stress tests. The release of the results surely conjured up some mixed emotions for JPMorgan shareholders. In March 2012, Dimon successfully guided the bank through the annual stress tests, and the charismatic CEO proceeded to announce the bank's intention to raise its dividend and initiate $15 billion of share buybacks before the institution had been given official approval from the Fed. Shares marched higher until the public was blindsided by the revelation of the losses in the bank's centralized investment unit by the now infamous London Whale. 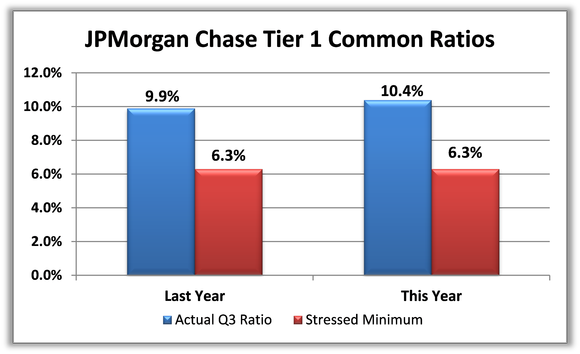 After taking his punches and a drastic pay cut, Dimon led the bank into the current stress test season with a Q3 2012 Tier 1 common capital ratio of 10.4%, around 50 basis higher than the previous year. Despite the higher actual ratio, under the Fed's "severely adverse" scenario, the Wall Street behemoth saw its Tier 1 common ratio fall to a minimum level of 6.3%, the same level as last year's test. Sources: Dodd-Frank Act Stress Test 2013: Supervisory Stress Test Methodology and Results. Comprehensive Capital Analysis and Review 2012. 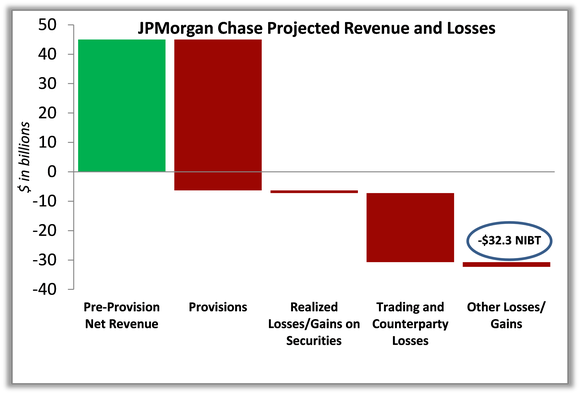 Compared to the 2011 projections for the nine-quarter severely adverse scenario, JPMorgan saw the Fed's estimate of its Pre-Provision Net Revenue (essentially a measure of operating profit) fall from $59.3 billion to $45 billion, and its Provisions for loss climb from $48.9 billion to $51.3 billion. Investors should note that these are not in any way a forecast of expectations, but rather the Fed's view of the bank if the global economy was to rapidly crumble. JPMorgan issued its own projections that posted higher PPNR and lower Provisions under the same scenario. Source: Dodd-Frank Act Stress Test 2013: Supervisory Stress Test Methodology and Results. While the test results do not give granular details of the PPNR composition, they do provide a breakdown of estimated loan losses by type. 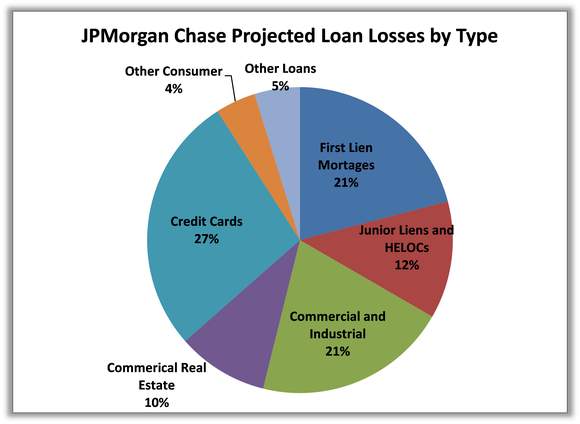 Despite its global reach and capital markets activities, JPMorgan remains very closely tied to the American consumer, with around 65% of its loan losses in the adverse scenario relating to consumer products. Although events in 2012 undoubtedly damaged Dimon's once-sterling reputation, he realigned the bank to continue marching toward higher capital ratios while continuing to grow revenue. Investors now look to next Thursday's CCAR results, which determine if these banks can increase dividends and share repurchases, to see if Dimon will continue his habit of returning capital to shareholders. With big finance firms still trading at deep discounts to their historic norms, investors everywhere are wondering if this is the new normal, or whether finance stocks are a screaming buy today. The answer depends on the company, so to help figure out whether JPMorgan is a buy today, I invite you to read our premium research report on the company. Click here now for instant access! The article Here's How JPMorgan Fared in the Stress Tests originally appeared on Fool.com. David Hanson has no position in any stocks mentioned. The Motley Fool owns shares of JPMorgan Chase. Try any of our Foolish newsletter services free for 30 days. We Fools may not all hold the same opinions, but we all believe that considering a diverse range of insights makes us better investors. The Motley Fool has a disclosure policy.